The seismic generation rate, SGR, at southern California along the 1981–2007 recording period is analysed with the main purpose of finding out whether there exist some correlations between seismic activity before, after and along aftershock sequences triggered by mainshocks of high magnitude. The possibility that a mainshock could be triggered by another neighbouring mainshock and its aftershock sequence is also investigated. The analyses are based on monthly SGR series, obtained as the number of events detected every month along the recording period considered. These monthly SGR series are derived for three aftershock areas associated with Landers (June 28, 1992, Mw = 7.3), Northridge (January 17, 1994, Mw = 6.7) and Hector Mine (October 16, 1999, Mw = 7.1) mainshocks. The most relevant features of SGR series are investigated through various techniques: 1) the rescaled range analysis and the interpretation of the Hurst exponent in terms of persistence, anti-persistence and randomness; 2) time trend estimation by the Kendall-tau algorithm and assessment of their statistical significance by the Mann-Kendall test; 3) the self-affine character, derived from semivariograms, and the Hausdorff measure; 4) autocorrelation and power spectra; 5) cross-correlation and cross-power spectra; 6) the search for the statistical distribution best reproducing the empirical probability of SGR series. Additionally, a close look at plots of epicenters within the aftershock areas, distinguishing between periods of background and aftershock activity, permits detecting some features of the seismicity. Changes on spatial patterns of seismicity suggest that the effects of tectonic stress redistribution could persist beyond an aftershock period, at short and medium distances of the mainshock. This possibility would be also in agreement with cross-correlation results for SGR series. 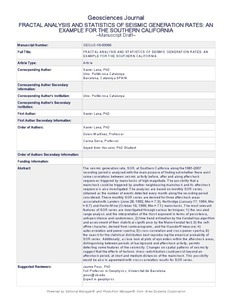 Lana, F.J., Martinez, M.D., Amir, S., Serra, C. Fractal analysis and statistics of seismic generation rates: the example of the southern California. "Geosciences journal", Juny 2017, vol. 21, núm. 3, p. 355-371.